Simon MacDougall from Comber is well known throughout the Emerald Isle for his epic Opel Manta Turbo build which we featured some four years ago but with the time, materials and money involved in this retro ride, Simon couldn’t enjoy the full potential of the car and sold it to pursue a dream of removing the marshals overalls and donning the racing overalls! 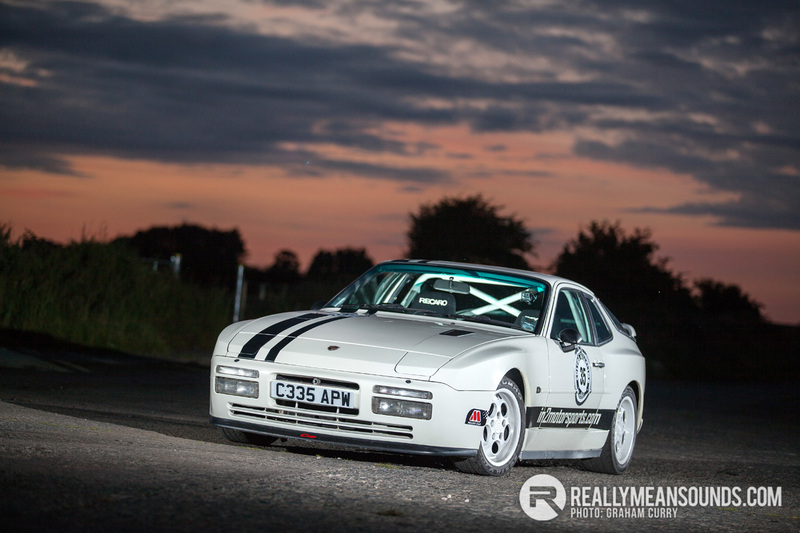 This spawned several memories of driving other people’s cars on track and instantly recognised the affordable enjoyment of a Porsche 944 Turbo and thus commenced a marathon session on UsedCars NI and various other such car sales sites to find the prime suspect. On collection of the car from Newcastle, England Simon knew he had made the right choice and thoroughly enjoyed the epic drive back to the ferry terminal. Whilst on the boat however a regular UsedCars NI trader even offered cash to buy it off Simon on the boat home, to which he declined. This was only the start line however and there was to be a lot of sleepless nights and fabrication involved before the finish line of the cars first event. This finish line wasn’t to be seen in any hurry however as Simon enjoyed using the Porsche as a luxury weekend retro sports car for well over a year. Within this year Simon helped out a good friend who had progressed from partaking in track days to being competitive on hill climb and sprint events. This is when it was realised how achievable and accessible clubman motorsport really was and the bug was firmly in place and the MSA license was applied for. This is when the workshop was tidied and the 944 Turbo was never to be the same again. Starting with safety Simon wanted to remove the stock seats in favour of some MSA spec carbon/Kevlar Recaro seats along with a club sport styled rear roll cage, which also supports the straps of the MSA spec racing harnesses. Whilst inside, Simon added an alloy passenger kick pate and fabricated a switch housing which seats like a factory option as an extension to the centre consol. Also installed within a custom alloy housing in the dash is a boost gauge, aftermarket rev limiter and air/fuel ratio gauge which all combine when monitored to prevent unnecessary damage to the engine. To aid with the cars times, Simon fitted stiffer springs and Kumho V700 road legal racing tyres and had the ECU remapped giving the car a rough estimate of 250bhp which is more than enough. And on driving the car personally I must say that eighties boost is something addictive, there is not much power at all and then all of a sudden a huge wallop of boost which holds tremendously and provides smiles per miles. With the added power and grip from the tyres, speeds on track and on the closed road hill climbs are as expected much greater and thus Simon then looked at upgrading the braking system. For this he employed a set of Performance Friction brake pads along with racing brake fluid and refreshed the brake components. This 30 year old car with just shy of 150,000 genuine miles on the clock is more than proving its pedigree with Simon fighting for tenths of seconds on events for class honours against machinery that is much more modern and technologically advanced. Simon would like to thank all those who have helped him get the car to the stage it is at now and also the Thoroughbred Sports Car Club of Northern Ireland and marshal’s without whom he would have no championship to compete in. We wish Simon the best of luck with the rest of the season and for many more to come.